*Games may be played on weekdays of the week if needed. **19U: The November 1st transfer deadline rule doesn't apply to the 19U Division for President's Cup. Players that transfer after November 1 can play in the 19U President's Cup. *13U-18U Gold Division Champions advance to Presidents Cup Regionals in Norco, California (Silverlakes Sports Complex). (Arizona State Cup 12U champion attends Regionals which is held at the same location at Silverlakes Sports Complex). 12U and 11U Gold and Silver flights for President's Cup do not advance to Regionals. Groups per Application: CLICK ON AGE. This is for informational purposes to let you know what you requested in your application. NOTE THESE GROUPS ARE NOT SEEDED AS OF 3/28/2019. 4/4 Preliminary grouping below disabled as real brackets/groups have been released. *Payments not received by deadline will incur a $100 Late Fee. **Payments not received within 3 days of published deadline will be removed from the event. ***Withdrawal from the event after the deadline will result in complete forfeiture of any fees paid. 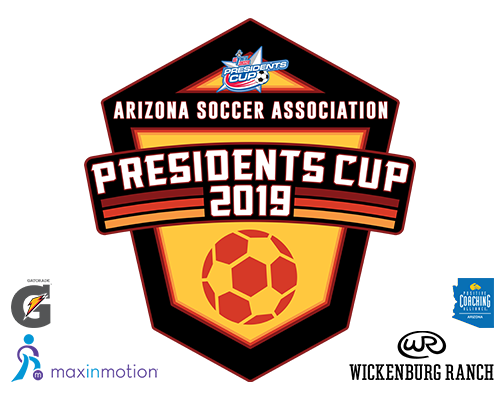 Arizona Girls 13U, Boys 14U, Boys 15U, Boys 16U, and Boys 18U* will be granted a Wildcard entry to the Presidents Cup Regional Championships in Norco, CA. That means the Winner of the Girls 13U, Boys 14U, Boys 15U, and Boys 16U President's Cup will advance as well as the Finalist (as the Wildcard). NOTE: The Arizona State Cup Girls 12U will also be awarded a Wildcard entry. The Boys and Girls 12U age group is played in conjunction with the West Region Presidents Cup (ages 13U-18U) in Norco, CA. *18U added 4/12 and communicated to teams. Players who transfer from one club to another club after November 1st will be ineligible for participation in both Arizona State Cup and Arizona President's Cup including Regionals and Nationals & the National Championship series (known as Arizona State Cup, Far West Regionals and US Youth Soccer Nationals) for that seasonal year. A transfer is defined as the process by which a player changes club affiliation, moving from one club and re-registering to a team within a different club within the same seasonal year. There is no limitation on transfers for teams participating in Arizona President's Cup. The November 1st transfer deadline does not apply to the 19U age group.